S.S Centrifugal Monoblock / Self-Priming Jet pumps are carefully designed to give best hydraulic efficiency and suction lift characteristics. Most modern and highly sophisticated machinery and technology are employed in the manufacture of these pumps, using quality raw material, seals and ball bearings to ensure long life. To keep the client satisfied, we manufacture and supply high quality Transfer Pump at cost effective price. Being a quality-leaning organization, we assure our clients that this pump is outstanding in quality. 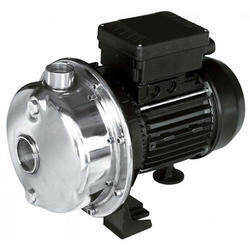 This pump is manufactured by utilizing quality tested raw material and highly developed technology by our experts. CEW sanitary stainless centrifugal pumps are monoblock design and designed for sanitary applications. The Pump is CIP design for the pharma, wood, beverage, mineral water, dairy, personal care and allied industries . Taha Pumps & Valves offers Stainless Steel (SS-316) Centrifugal Pumps, CFP Series. 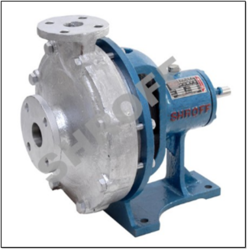 Impeller: Cast Iron / SS - 316, Cast Steel / Bronze etc. Pump Casing: Cast Iron / SS - 316, Cast Steel / Bronze etc. Capacity : 400 M3 / Hr.